In two days more than 2,000 Washington state residents have signed up for appointments to receive the new enhanced driver’s license. The program was introduced on Tuesday. The ID card will not only serve as a driver’s license for residents but also be a passport card that will enable them to cross land and sea borders. Residents that want the card have to prove citizenship and identity with different documents before it will be issued. Candidates also have to undergo a brief interview. The card contains a radio-frequency identification chip that holds a unique reference number. That number acts as a pointer back to a secure database which brings up the cardholders’ photo and other information on to border crossing officials. 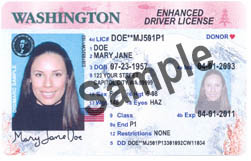 The Washington Department of Licensing is also using facial recognition technology to try and ensure that the same individual isn’t issued more than one ID. A one to many match is performed and checked against a database of existing license holders. The enhanced driver’s license is a voluntary program. Residents wishing to participate must pay an additional $15 fee, on top of the $25 renewal fee.